Find hotel near Church Of The Holy Apostl ..
Also called as Agii Apostoli, the Holy Apostles church in Athens dates back to 10th century. 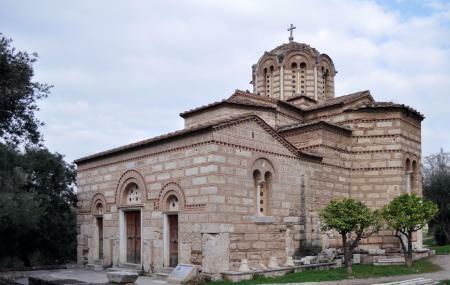 Located in the Ancient Agora, this church has contributed heavily to the development of Byzantine architecture in Greece. The church follows the plan of a Greek cross (a cross with equal arms), with a narthex on the west side. There is a dome that rests on four pillars in the central crossing. Due to its style of architecture, this dome enjoys the status of being the oldest example of the "Athenian type" of Byzantine dome in the city. Also, this church has seen a history of ravages as it was heavily damaged during the war over Athens between the Ottomans and Venetians around 1687. However, it was in the 18th century that it was reconstructed for public view. Recommended time to visit is 10:00 am to 2:00 pm. How popular is Church Of The Holy Apostles, Athens? People normally club together Eleusinion and Herakleidon Art Museum while planning their visit to Church Of The Holy Apostles, Athens. Incredible ancient church perfectly preserved. Too bad it was locked. Rather small old church with particular architecture and interesting so see. To enter and watch thé inside was permitted as well as taking pictures. Unfortunately, the restoration of this Church makes the frescoes that are displayed slightly blend. Also historically entirely correct but it still feels weird walking in a Church in the beautiful yet mostly ”all-Greek” Agora. Beautiful collection of frescos inside the church. Beautiful little church with gorgeous frescoes in various states of repair and disrepair. Absolutely quiet and peaceful. A calm within the storm of the city.